Hi everyone! 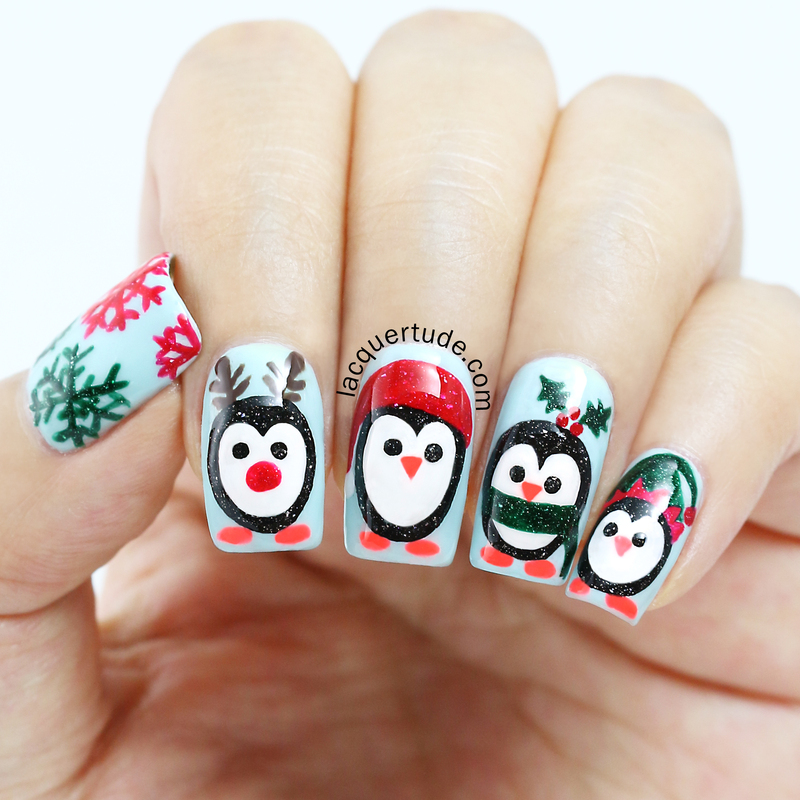 So, I’ve been thinking of creating a penguin nail art celebrating the holiday season for a while now. And finally, I’ve done it and I really love how it turned out! Whenever I think of the winter, I also think of penguins, and how cold I was the first time I saw them. I find them such fascinating creatures, both cute—the way their bodies wobble when they walk; and romantic—the way the daddy and mommy penguins take turns caring for their young. I recently also watched a BBC documentary about Emperor penguins of the Antarctic, you can see a youtube clip of it at the bottom of my post. I learned a lot more about how versatile and agile their bodies really are (of course more in water than on land). For my nail art, I added little reindeer antlers, Santa hat, holly berries, and elf hats on their heads so they’re all ready to celebrate the holiday season with us! 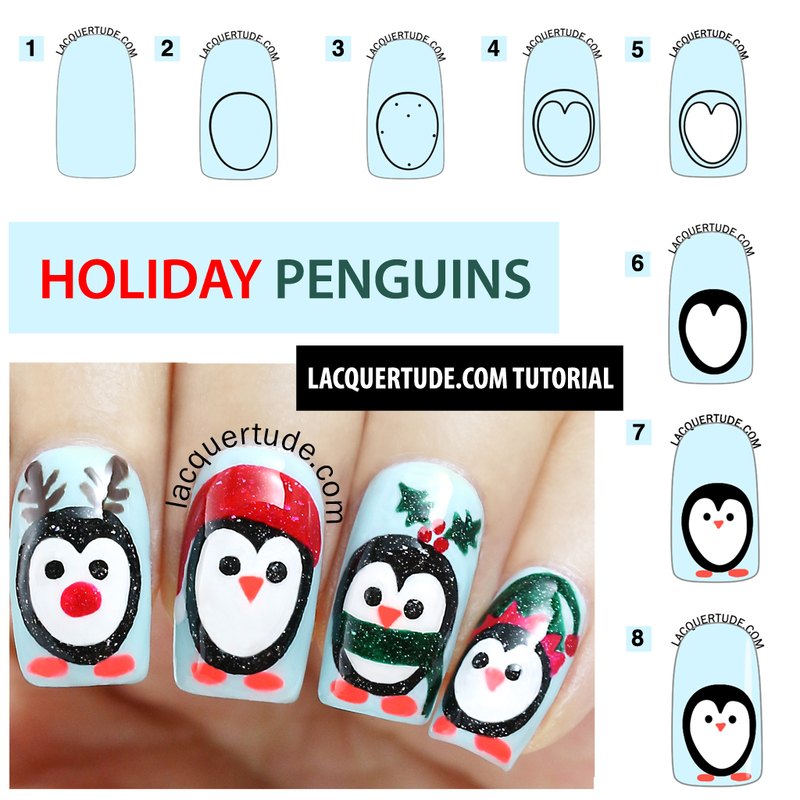 As usual, I created a tutorial so that you can have these cute little penguins on your nails too to celebrate with you! So, here are the steps. Step 1: Paint 2 coats of Sky and let dry completely (or apply a thin layer of quick dry topcoat). Step 2: Using Starry Night, with a thin nail art brush, draw the outline of the penguin. Here, to maximize cuteness, I chose to draw it in the shape of an upside down egg. Step 3: Using Starry Night, dot the shape of the inside of the Penguin in preparation for step 4. Step 4: Connect the dots you made in step 3 to form the inside shape of the penguin’s brows and belly. Step 5: Fill the inside shape with white polish. Step 6: Fill the in between space with Starry Night. Step 7: Dot the eyes with Starry Night and draw the beak and the feet with Sunset. Step 8: Seal in your design with your favorite topcoat to protect your hard work and let the Penguins entertain your holiday season! 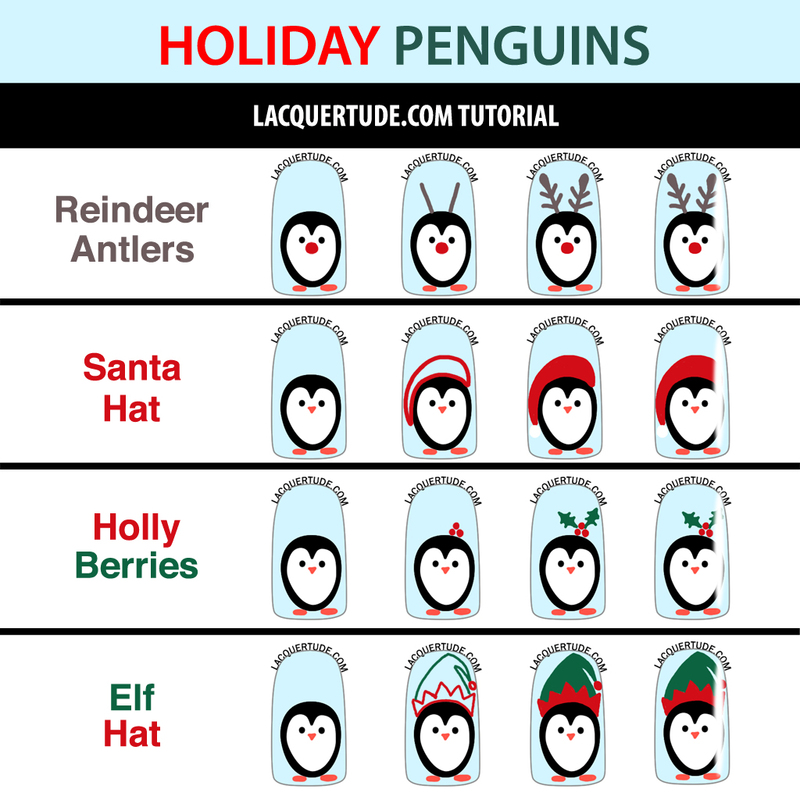 And below is the complete tutorial collage for how to decorate your penguins for the holiday season!!! There you have it! You can find my tutorial for how to draw your own snowflake here. Do you like this design? If you recreate it, don’t forget to tag @lacquertude and hashtag #lacquertude on Instagram and you can follow my account here, or post your photo on my Facebook wall. Here is the youtube clip of the BBC documentary I talked about earlier in my post. Enjoy! Thank you so much for reading and have a happy Sunday! Do you have any video tutorials? I find them easier to use. Such a cute nail art design and the tutorial was SUPER easy to understand! Thank you so much for sharing! I love how you did a tutorial for each type of penguin design that’s brilliant!